When head coach Will Muschamp officially took over the Florida Gators back in 2011, he and then-defensive coordinator Dan Quinn both spoke extensively about “affecting the quarterback,” getting pressure on the opposing signal caller, knocking him to the ground and creating game-changing plays. Florida has not been able to do much of that in Muschamp’s first two years (or Urban Meyer’s last season in 2010). After dominating opposing quarterbacks in 2009 with 39 sacks, the Gators registered just 21 sacks (-18) in 2010, 28 sacks (-11) in 2011 and 30 sacks (-9) in 2012. Trending back upward, yes, but nowhere near as disruptive as he wants the defense to be on a consistent basis. Muschamp aims to buck that trend next season by loading up Florida’s starting 11 with as many talented pass rushers as possible. 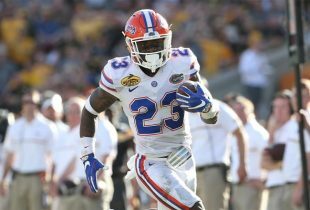 In a post-spring practice depth chart released on Wednesday, the starting-off point for the Gators in fall practice, Muschamp has sophomore Dante Fowler, Jr. inserted as the starter at BUCK with redshirt junior Ronald Powell, who has been listed at that position the last two seasons, as the starting Sam linebacker. Powell’s versatility – as well as that of many of Florida’s defenders – allows Muschamp to make that switch with ease. Not only can Powell play both BUCK and Sam, Fowler can spend time as Buck and defensive end, ensuring that both can be on the field at the same time no matter where they are situated on defense. Pass rushing will not be limited to Powell and Fowler, of course. Senior Dominique Easley is listed as a starting defensive tackle but can easily be moved outside to defensive end (the position he played all of 2012), and sophomore DE Jonathan Bullard – like his classmate Fowler – appears to be primed for a breakout season. Beyond those four players, Muschamp likes what he has seen from redshirt junior Neiron Ball, who is listed as a back-up Sam linebacker behind Powell but can also play BUCK. He is also pleased with the continued improvement of senior Darrin Kitchens, the first-string Will linebacker heading into the fall. “Darrin Kitchens’s development as an inside linebacker enables that move [to Will] to happen. He played extremely well throughout the spring for us. He’s a guy, going into his senior year, has played some good football for us,” Muschamp said. The Gators lost seven of their 2012 defensive starters including both defensive tackles, all three linebackers and both safeties, but Florida’s talent and depth at pass rushing positions has the defense primed to be more disruptive than it has been since 2009. Having fowler, Bullard, Easley AND powell all on the field is a terrifying prospect for quarterbacks. I feel like 2013 we will be much better in the passing defense but with losing floyd/whole interior defense the run defense won’t be as good. Love the idea of Easley, Powell, Fowler, and Bullard all on the field at the same time. 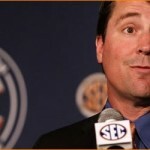 Love the way Muschamp’s mind works.